It’s been 148 years since I’ve had any desire to go out on the eve of the new year. The combination of amateur hour, price-gouging, over-crowded rooms and bad food, not to mention the elusive NYE babysitter, have made staying in not only the better option but something I look forward to. We get to visit another country (and this year have the added bonus of visiting an alternate world of witches and wizards) without leaving the house. The end of 2013 saw BD, the fellas and I visiting Spain in the company of Harry Potter and gang. My love of grazing (I must have been a goat in a previous life) and our plan to serve at the coffee table table makes cocktail party food the perfect choice. Tapas, anyone?! 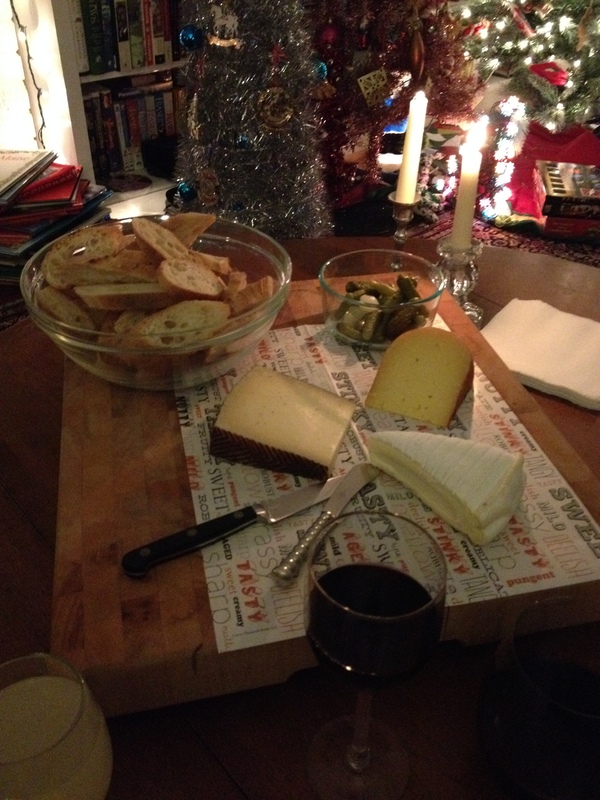 We served happy hour at 5ish with cheeses, bread and cornichons (the errant d’affinois needed a fellow Frenchy). Ryan and I enjoyed some nice reds and the boys, San Peligrino Limonata (a little detour to Italy). A little after 8 we served albondigas (meatballs), patatas bravas (the very best potato dish on this earth and this is coming from an O’Donnell), and camarones escalfados en aceite con ajo (shrimp poached in oil with garlic … thank you Google Translate!). For the final bit of the conversational portion this post, I wish us all a healthy and happy new year. Though I’d add prosperous to that, I am assuming that if winning the MegaMillions is to be, the fates would categorize it under happiness. If it wouldn’t add to happiness (as if …), I guess I don’t want it. But hey, since we’re asking … let’s throw in a little peace on earth. My one and only resolution is that I will try to add to that … or, on my bad days, not take away from it. Manchago, Mahon (both Spanish cheeses), and d’affinois (French triple cream… because I LOVE the stuff) along with the wee French pickles and drinks started the evening. Dinner was (top left then clockwise) albondingas, camerones, and patatas bravas. Tasty bites, prep done early in the day, put together quickly for serving – perfect meal for a laid back occasion. These dishes benefit from quality ingredients (don’t they all…). San Marzano tomatoes do make a difference. Fresh peeled garlic, ditto. Shrimp that has not been frozen, preferable. Mayo should be full-fat. Save the fat-free for … oh, I have no idea. Just cut back somewhere else. Off the soap box now! I made the meatballs and simmered in their sauce earlier in the day and then refrigerated them until it was time to reheat. This wouldn’t have been necessary except that it was about 6 hours and I am a sort of germ freak … I didn’t want festering organisms ruining the new year. I threw in a few chorizo links (the fresh sort, not the dried sort) to cook with the meatballs. I wanted a little spicy heat in the dish, something the meatballs don’t have. 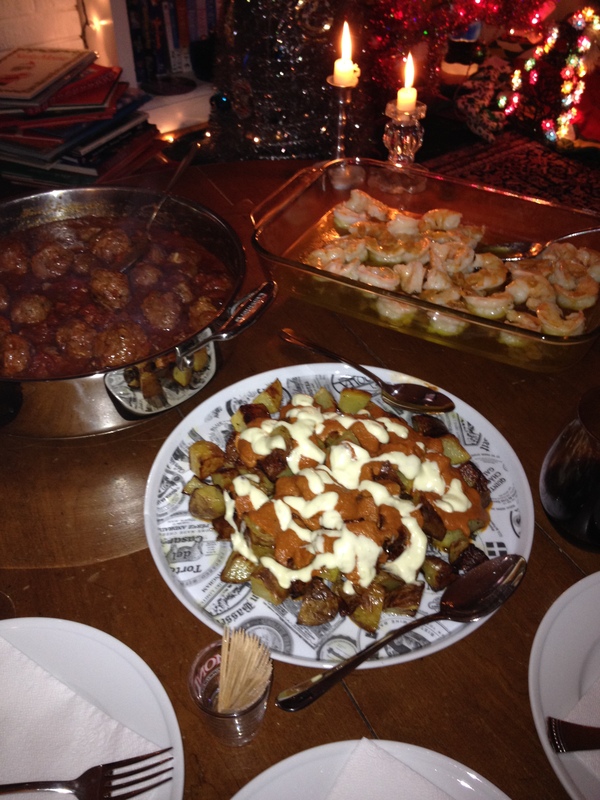 I made the sauce and the aoili for the patatas bravas early in the day as well. I also had the potatoes washed and ready to cut which I did just before tossing them in olive oil and roasting in the oven for 45 minutes at 450 degrees F.
A note about the aioli … I made a mayonnaise-based aioli. Traditionally, and most tastily, it is done with egg yolk but, as I’ve mentioned, I am a freak about germs and since I only had regular grocery store eggs, I wasn’t feeling the comfort level of using a raw egg for this. The recipe below is a pretty decent alternative. When the potatoes came out, I cranked the heat to 500 degrees F, tossed the cleaned shrimp (this cannot be emphasized enough, CLEAN shrimp if you like the folks you are serving) into the garlic-infused oil for about 4 minutes to poach to perfection. The shrimp needs to be cooked last minute. The garlic-inflused olive oil though I made earlier in the day, saving the toasted slivered garlic for sprinkling on the finished dish. Can I tell you, my house smelled goooood all day. Below are the recipes, none are my own (except the aioli which I have no one to attribute it to) though I’ve tweaked each a bit. I’ve linked to the original recipes of the patatas bravas and the albondigas but the shrimp came from my sister, Monica, so there’s nothing to link to … however, I’ll give out her number if you’re interested. Ha… um… kidding. Make the red sauce: In a small (1- or 2-quart) saucepan, heat the 1-1/2 tablespoons olive oil over medium heat. Add the onion, carrot, and garlic and cook, stirring frequently, until softened but not browned, about 5 minutes. Add the wine and let it reduce until almost evaporated, about 1 minute. Add the pimentón and cumin and stir for about 15 seconds. Add the tomatoes and juice, thyme sprigs, sugar, Tabasco, 1/2 teaspoon kosher salt, and a few grinds of pepper. Make the aioli: Mash the garlic in a mortar and pestle with the salt until you have a smooth paste. Add the rest of the ingredients and leave to chill and marry. I do this in a plastic baggie so that I can clip a corner for drizzling over the potatoes for serving. Put the potatoes in a low serving dish and spoon the red sauce atop and drizzle with the aioli. Or put the sauce into a bowl alongside the potatoes, drizzled with the aioli for dipping. To make the meatballs: In a bowl, combine the onion, garlic, meat, parsley, egg, breadcrumbs, spices, salt and pepper. 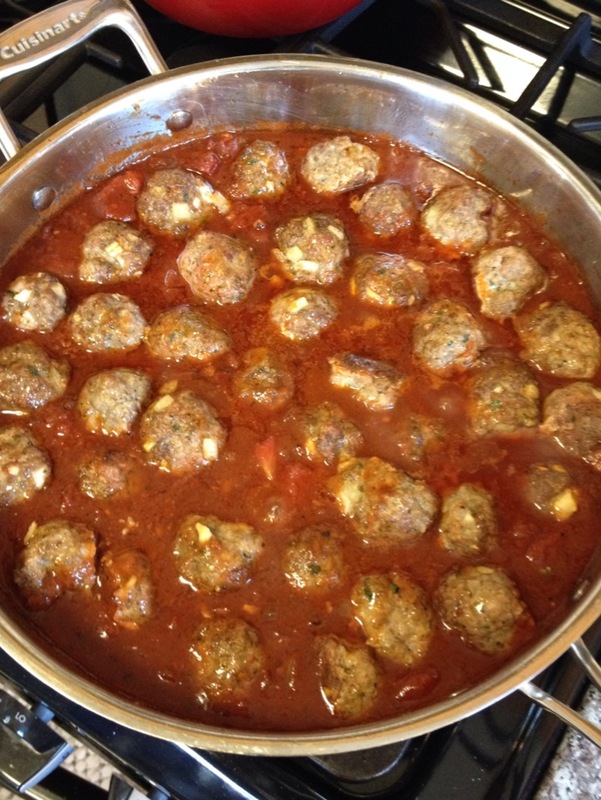 Using your hands, mix to combine – try not to overwork the mixture or the meatballs will be tough.Dampen hands. Shape the meat mixture into 1-inch balls. Place on a foil-lined baking shete and bake at 400 degrees F for 20 minutes. To make the tomato sauce: Add oil, onion and garlic to a frying pan and cook over medium heat, stirring occasionally until softened, about 8 minutes. Add the red wine and simmer until reduced by half, scraping up all of the bits from the bottom of the pan. Add the tomato paste and spices and cook for 1 minute, or until fragrant. Next add the honey, tomato sauce, fire roasted tomatoes, salt and pepper and simmer over medium heat until the sauce thickens, about 15 minutes. Return the meatballs to the pan, reduce the heat to low, cover, and simmer until the meatballs are fully cooked in the sauce, about 10 minutes. Sprinkle with parsley before serving. Heat the oil in a small saucepan over medium heat. Add the garlic and cook until lightly browned, stirring frequently. This can take up to 10 minutes depending on how “medium” your heat is. Don’t let it burn. Scoop the poached garlic onto a paper towel when done. Reserve the olive oil to poach the shrimp. When you are ready to serve: Preheat oven to 500 degrees F. Put the reserved oil into a pyrex casserole dish and let heat for 5 minutes. Add the shrimp carefully (if the oil is the right temperature, you’ll get a bit of splatter). Cook for about 4 minutes or until lightly pink. Better underdone than overdone – it stays in the oil so will carry over quite a bit of residual heat. Remove the casserole from the oven, sprinkle with a light whoosh of salt (1/2 tsp or so) and black pepper. If I have an extra lemon, I will squeeze the juice over as well. Gives almost a scampi flavor. Not necessary but nice. Sprinkle the reserved browned garlic over the shrimp before serving. Don’t forget the bread for dipping. This entry was posted in Appetizer and tagged albondigas, appetizers, camerones, cocktail party, family dinner, finger food, happy hour, meatballs, New Years Eve, party food, patatas bravas, potatoes, shrimp, Spanish, tapas. Bookmark the permalink.